Need help check here. Have advice for other players? Post here. As some have noticed I have started dabbling with HTML and made a cheesey site for waypoints. http://waypoints.droppages.com/ Recently decided to add Points of Interest to the page as well. Things like public farms and maybe other things in future. I'd hope to fill the sides of the page with all sorts of useful stuff and/or details of server waypoints. If anyone knows of updated, maintained, public farms near waypoints I could add please let me know ingame. Also I noticed the occasional players from 2011 coming back in which I'd reminisce the past with, so at the bottom of droppages site I added list of the Beta Map Waypoints for them to enjoy the nostalgia. For those who may wonder. The beta map was during the Minecraft Beta development. Shortly after the official release of Minecraft 1.0 in November 2011 we got the map we have now. This started with the continent most know as "/OC" or "Old Continent". A year or so later the map doubled its size adding "/NC" or "New Continent" and eventually it doubled again adding "/PP" or "Planet Pandora" (reference to James Cameron's Avatar"
For a time we had tried having a creative server as well. It got out of hand with the griefs and such. I don't have the waypoints for it but including the downloads in this post for the nostalgia. Note: These old maps use Region file format and will need to be updated to Anvil file format to open(just open the world, mc updates it for you). This takes a long time, longer if you use modded mc. also... Titan waypoint isn't active at the moment. Also started striking out the inactive ones on the interactive list and colour coding the original post. EDIT: I've added a bunch of public auto farms to DragonFall. 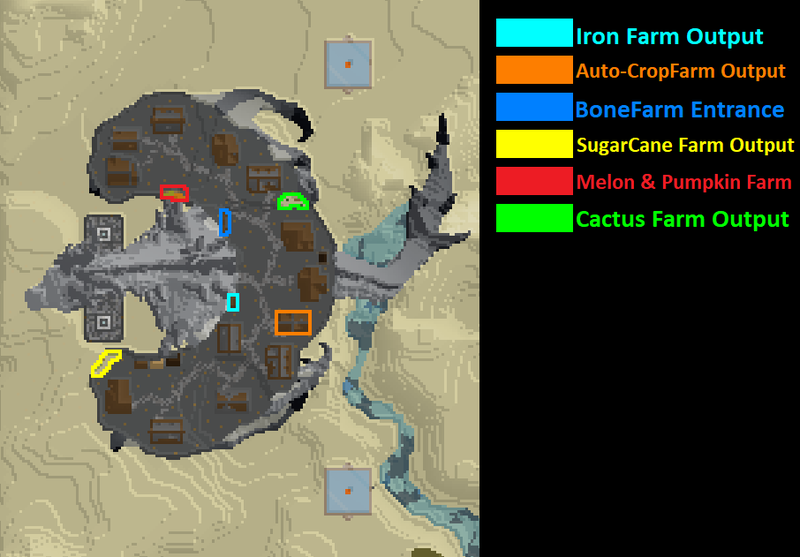 Heres a map with markings where each farm outputs the items. Last edited by maxmmm1501 on Wed Aug 08, 2018 10:23 pm, edited 1 time in total.